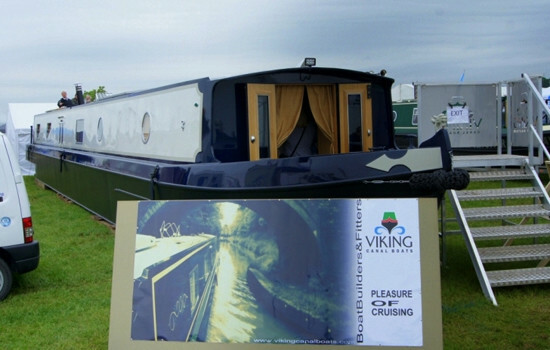 In this section I am going to take you through my initial thought process regarding the design/layout of the boat builders ‘Crick Show Boat’. 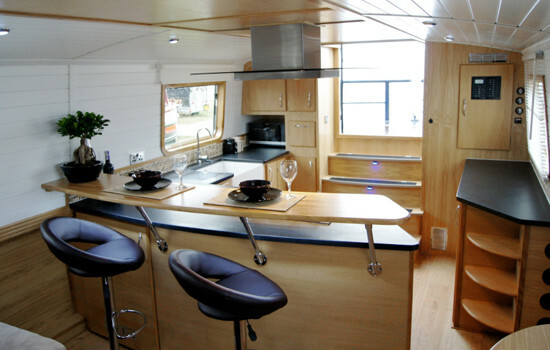 This is post the order being placed and with the knowledge that the boat we were buying was to be of a bespoke layout. 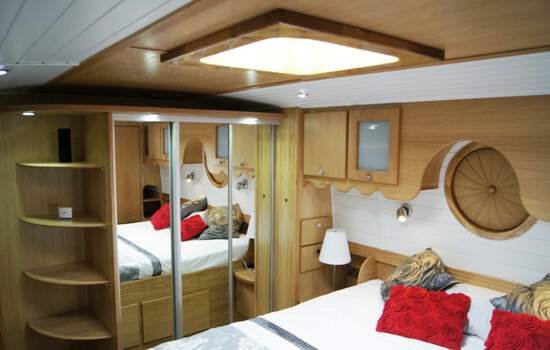 The comments in this section are no means meant to be criticisms of the boat design but more observations regarding what we would change to personalise the boat to meet exactly our needs. Being of a design background this was certainly the beginning of the most exciting design project I’d ever been involved in! The colour scheme we felt was perfect, different but unobtrusive to the eye. 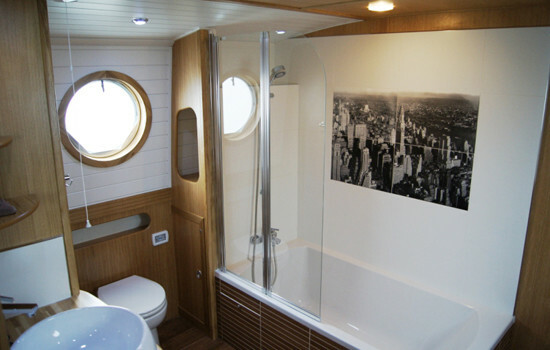 The boat had a natural feeling of elegance and style. 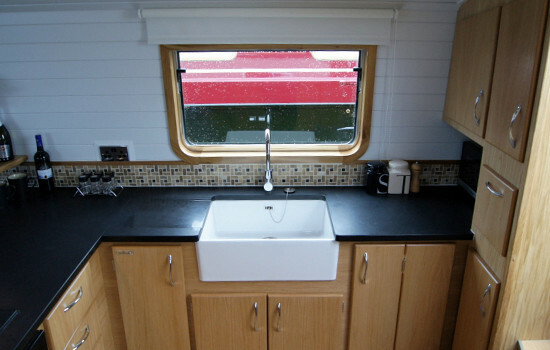 The Belfast sink was certainly a major plus along with granite work tops. The only initial thought here was to swap the roller blind for a Venetian blind… Minor change! Ceramic hob with an extractor fan, perfect! Both modern and practical. 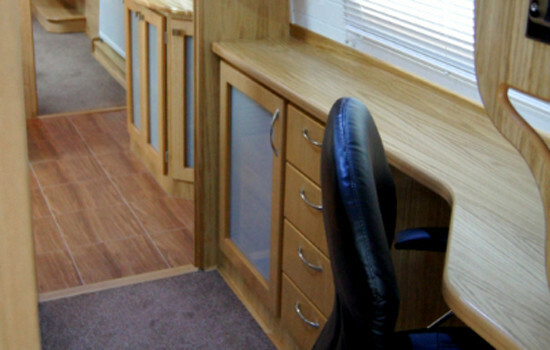 Breakfast bar creates a dining area whilst keeping the space used to a minimum. Initial thoughts regarding changes here… Only to put cupboard doors where the shelves are (to the left of the cooker). This would keep the dusting down, keep the boat looking minimal and safe guard from anything falling off the shelves whilst cruising. Washing machine included and plumbed in under breakfast bar, utilising the dead space in the corner of the kitchen beautifully. Electrical panel and cupboard logically placed and gauges galore, to see a water tank gauge was a pleasant surprise! Gone are the days thinking can I push another shower out of the water tank! The only initial design changes springing to mind were to put cupboard doors in front of the shelves and lose the wine rack giving the cupboard more internal size. 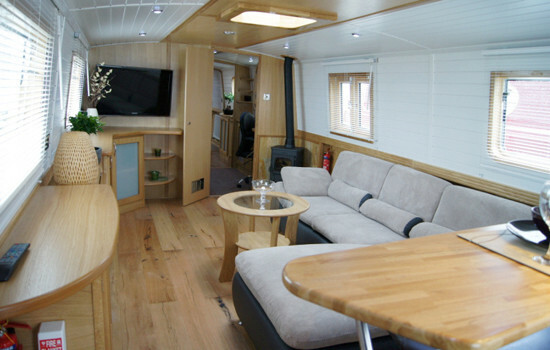 Wow this had to be the biggest sofa I had ever seen on a canal boat. I could instantly see myself lounging out on here! The fold up/down table would not be required for us as the breakfast bar solved our dining requirements so this could be used for more storage. Huge TV wouldn’t go a miss! Initial concerns regarding its power consumption but these were quickly put at ease when I saw it was based on LED technology. 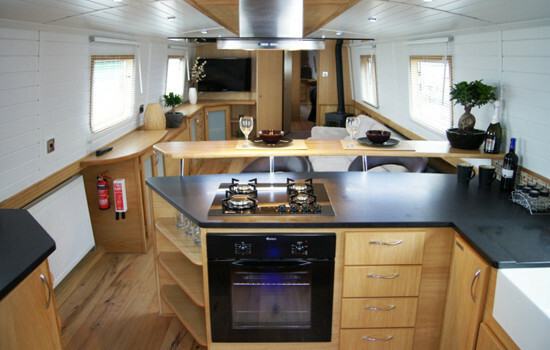 Solid Fuel Stove positioned very wisely in the the centre of the boat, maximising the heat transfer and efficiency. Difficult to photograph landscape… This is the spare room. Sliding door as the entrance was a good space saving touch. Bunk beds opened up the flexibility and facility to have people to stay or as a child/children’s bedroom. 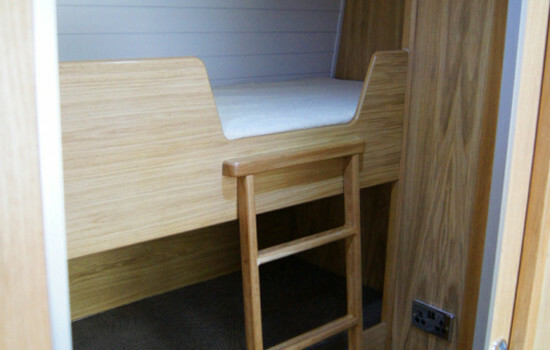 A spare room was a requirement for us, the bunk bed idea perhaps not best suited to our requirements so this would need to be considered and explored through the design process. Neatly placed this office is opposite the spare room. 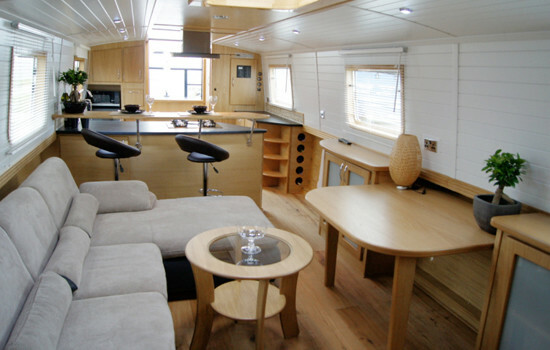 An office area was an absolute must for us as the boat would be a place of work. This office design would be a great space for personal work. Being self employed and requiring dual monitors for my work this space would need looking at in more detail during the design process. Great ready… A Full size bath! Nine years of boating without this luxury I could not wait to get in! Loved the decal on the tiles really made the room stand out. Food for thought regarding this room, firstly the fact it was a walk through. The boat I was on now was a walk through. I found walk through bathrooms great when living on your own but not so much when living with a partner. Its good to keep some privacy! The open shelf looked like it wasn’t maximising space and a cupboard door could well be added here. Also noticed the shower back did not reach the ceiling which meant you couldn’t move the shower head up to ceiling height? This would definitely need addressing. The Cooke & Lewis basin sets the room off perfectly with a contemporary chrome tap and large mirror, nothing to change here. The only item I felt did not do this room justice was the towel rail. In my opinion it just didn’t match the modern elegance of the rest of the bathroom. 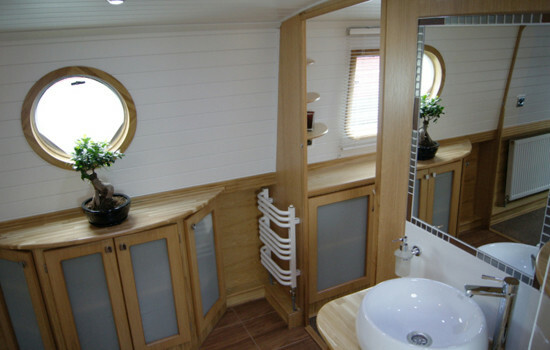 This would most probably look better being a chrome towel rail in a different style to the one included with the boat. Great sized bedroom, probably the biggest I have seen. Plenty of storage which is always essential in the bedroom. Loved the port hole buttons, these are both functional and practical. Houdini hatch for us is not best placed in the bedroom for obvious reasons in the morning. The open shelves to the left on the front bulk head would be better suited as drawers in our opinion. The unit to the right was nice and practical but just didn’t feel it was the best solution… Although at this stage we could not think of a better use for this space. 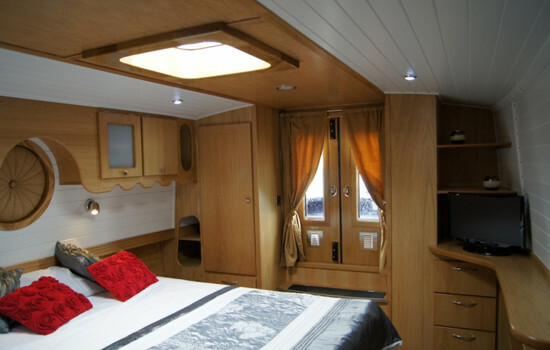 The red cushions on the bed really stood out and when it came to deciding on the fabric colour for the port hole buttons and curtains red would definitely be a consideration. Look at these wardrobes! Contemporary with space saving sliding doors. The mirrored fronts also enhanced the illusion of further space. My only initial thought was to extend the wardrobe out where the shelving is to further the rail space for our clothing.